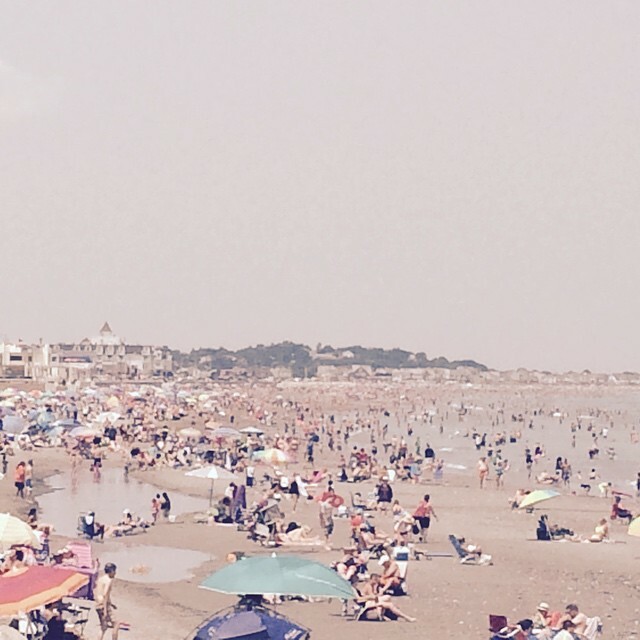 Nantasket Beach goes on for miles and miles, and honestly, there were miles and miles of people. It was like a beach event. I have been a beach person since earliest times. Maybe it was all that water in the womb? Is that stuff salty? I am most comfortable, most at home, most happy when I am on sand, breathing in sea air, listening to waves and gulls, slathering on Coppertone (that smell a world of happiness all by itself). Yesterday I went to Nantasket Beach, because my sister lives nearby and we stayed at her house while she was away and took in the local color. That meant salt water, the sounds of silence in her backyard, and a fab dinner in Hingham at Tasca, with a goodbye breakfast at Toast (this place is DEEEEE-LICIOUS). It was only two days, but it was really fun. But i digress. Back to the beach. I am telling you, there were about 2, 340, 107, 375, 295 people there, give or take a few. It was maybe the most crowded beach day I have ever been part of. I sort of still can’t believe it. Still, there were waves, and plenty of Coppertone. And while it was too crowded and hot for me–a rarity–I still enjoyed being at my Church, the ocean.